During the winter months, U.S. Army Garrison Rheinland-Pfalz prepares for the likelihood of inclement weather in the form of freezing rain, snow and ice, and stands ready to make difficult decisions when it comes to road conditions, duty reporting and school closings. “The safety, security and well-being of our Soldiers, civilian employees and family members are vital; therefore, we are dedicated to providing timely, accurate information to minimize risk and ensure safety within our military community,” said USAG RP Commander Col. Jason T. Edwards. Due to rapidly changing adverse weather, collecting information and making timely judgement calls can sometimes be challenging. That’s why it’s important for the commander to make prudent decisions, since they affect garrison safety. “Severe weather conditions can pose a significant hazard to public safety,” Edwards explained. “To combat that, we have inclement weather procedures in place to help us make the best decisions for the weather conditions occurring at the time. Military police provided assessments throughout the night making the same recommendations, but “being new to the region, it was great for me to get eyes on firsthand,” Edwards said. When adverse weather happens overnight, driving conditions can become hazardous. During these instances, military police units report worsening road conditions between 2 and 3 a.m. to the garrison’s Director of Emergency Services Lt. Col. Victor Baez-An. Afterwards, the DES director informs the garrison commander of the current inclement weather conditions, they review reports and also take into account the forecasted weather for affected installations. School buses are a major factor in the decision process. School closure decisions impacting Kaiserslautern schools must be made jointly in a coordinated effort between the Army and Air Force commanders no later than 3:30 a.m. For Baumholder, the call must be made by the Army no later than 5 a.m. This remains the target window to ensure buses stay off the road, Edwards explained. If poor weather is inevitable, all measures will be made to make the decision the night before, he said. If weather conditions begin deteriorating in the morning once people are already at work and children are at school, the garrison commander will establish whether early release or school closures before noon is applicable, so children can be transported home safely. When early work release is initiated by the garrison commander due to bad weather, all garrison facilities will close as soon as they are able. Army Child Development Centers and School Age Centers will remain open to accommodate mission-essential personnel only. Non-mission essential personnel will be contacted for early pickup of their children. Mission-essential personnel will be determined by mission and will vary. Garrison directors will notify their employees if they are considered mission-essential. In general, mission-essential garrison employees may include emergency services, emergency repair, snow removal and Emergency Operations Center personnel. Depending on mission needs, other agencies and personnel may be included as essential personnel. In any case, when inclement weather makes driving hazardous, everyone (to include mission-essential personnel) should refrain from driving until the roads are safe to do so. 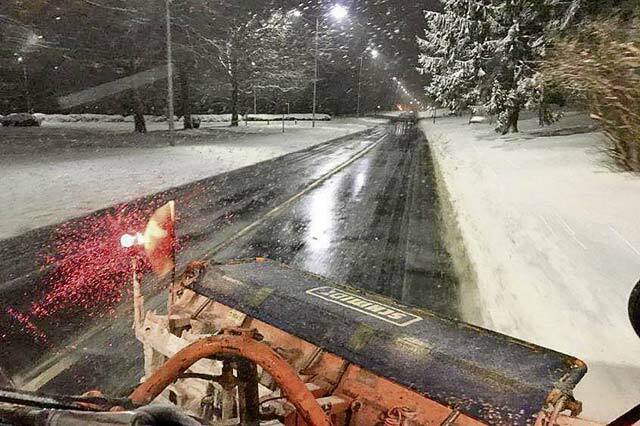 People can access up-to-date road conditions for all garrison installations on the Installation Management Command-Europe Road Conditions page at: https://home.army.mil/roads/. The page is updated by DES based upon military police patrols on each installation. Please note, however, the page only reflects driving conditions on post and not in local communities surrounding the installations. Road conditions outside the gates can vary widely from better to worse than what is indicated for government vehicle travel on post. Understanding post road conditions is an important part of staying safe during inclement weather. The IMCOM-Europe page displays road conditions in designations of Green, Amber, Red or Black. Green – Road conditions are normal. Amber – Road conditions vary from normal to dangerous. Vehicle operators should exercise additional precautions. Most installations should be open, but stay tuned for possible late reporting or early release. Red – Road conditions are hazardous. Exercise extreme caution. Individuals are discouraged from driving privately-owned vehicles unless absolutely necessary. Possible late reporting or early release of personnel and closure of services. Black – Road conditions are extremely hazardous. Government -owned vehicles used off base or off post are at the discretion of the owning commander. POVs should not be on the road. Installations will likely be closed. Motorists should also drive cautiously off post, because roads may be more hazardous in the local communities surrounding installations, especially at higher elevations such as Baumholder and Sembach.